Stockholm-based niche line established in 2006 by Ben Gorham, and originally specializing in home fragrance products. The name Byredo is short for "by redolence"; the fragrances were reportedly all inspired by Gorham's memories of specific times and places. Personal fragrances were introduced in 2008 with Rose Noir, Gypsy Water, Chembur (now Encens Chembur), Green & Pulp. Later releases include Fantastic Man (2008; later renamed Sunday Cologne), Bal d'Afrique (2009), Blanche (2009), Baudelaire (2009). In 2013, Manzanita Capital bought a majority stake in the Byredo brand. 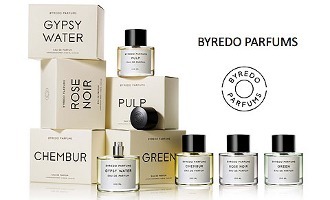 In the US, the Byredo line can be found at Aedes, Barneys or Luckyscent. In London, try Les Senteurs or Liberty. See all articles on Now Smell This tagged Byredo.